Taste this terrific Heirloom Tomato Salad. 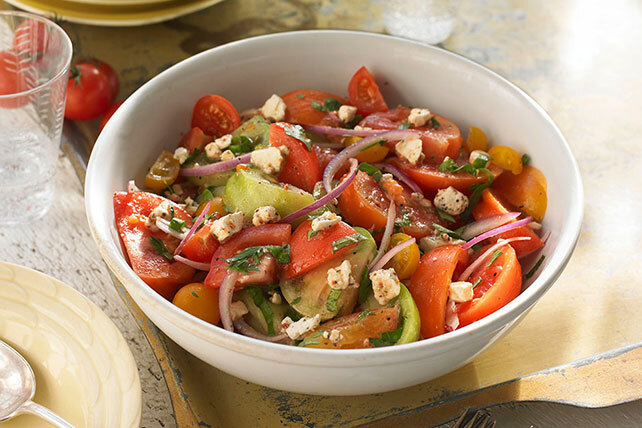 Juicy tomatoes, savory cheese and fresh herbs make this tangy summertime salad a real crowd favorite. Heirloom tomatoes come in all sizes, shapes and colors. For best results, use a variety of different colored and shaped tomatoes when preparing this seasonal salad. Just chop, quarter or halve the tomatoes depending on their size before combining with the remaining ingredients. Salad can be made ahead of time. Prepare as directed, but do not add the cheese. Refrigerate up to 8 hours. Toss with cheese just before serving.